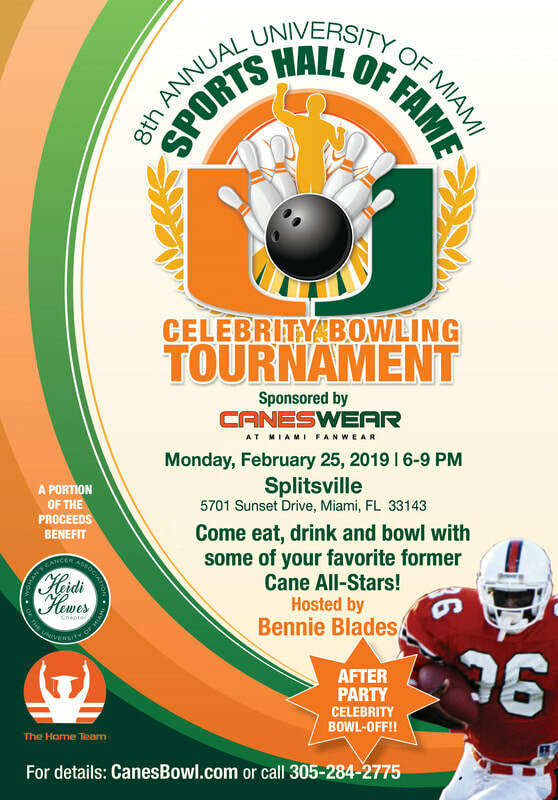 Bennie Blades, a member of the College Football and University of Miami Halls of Fame, will serve as host of the UMSHoF's Eighth Annual Celebrity Bowling Tournament sponsored by Canes Wear, on Monday, February 25, from 6-9 p.m., at Splitsville in the Shops at Sunset Place in South Miami. "I'm looking forward to hosting the upcoming UMSHoF Bowling tournament this year," said Blades, who, along with his 1987 defensive secondary teammates led Miami to their second National Championship. "It's always a good thing to get together with Canes fans to support the Hall of Fame and the charities they contribute to." "As we prepare for the 8th year of our annual celebrity bowling tournament, we're excited to be partnering this year with both the Heidi Hewes Chapter of the Woman's Cancer Association and The Home Team, as well as welcoming back our returning sponsor, CANESWEAR. We're also pleased to announce that this year's host will be UM Sports Hall of Famer and College Football Hall of Famer, Bennie Blades" said bowling tournament chairman Gerard Loisel. Teams start at $500 for four bowlers, regular sponsor lanes are $1200 and premium sponsor lanes are $1700. Social tickets can be purchased for $75 for adults (T-shirt included) and $25 for children under 12. This year, a portion of the proceeds from the event will go to the Heidi Hewes Chapter of the Women's Cancer Association, and The Home Team. For more information on being a sponsor, bowling teams and social tickets, contact UMSHoF Executive Director John Routh at 305-284-2775. UMSHoF LEGENDS NEVER DIE Art Show...January 11-13 ! 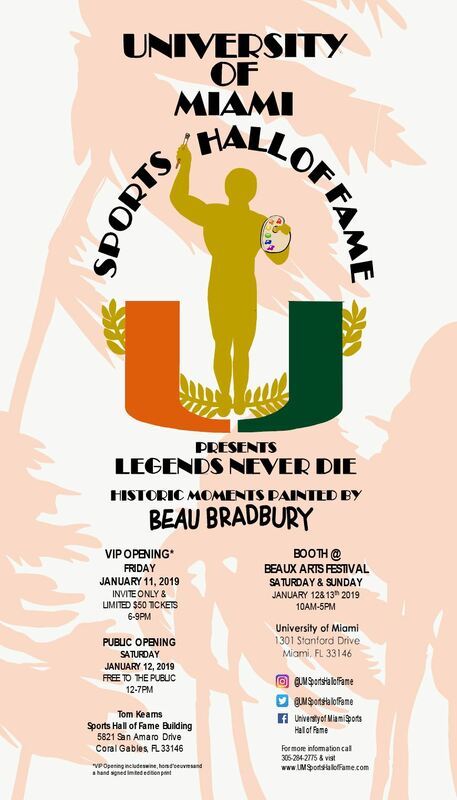 The University of Miami Sports Hall of Fame is partnering with legendary artist Beau Bradbury to present a unique art show and sale, "Legends Never Die" at the Tom Kearns Sports Hall of Fame Building on the Coral Gables campus, January 11-13. The show at the Hall of Fame coincides with the Beaux Arts Festival on the campus that weekend. 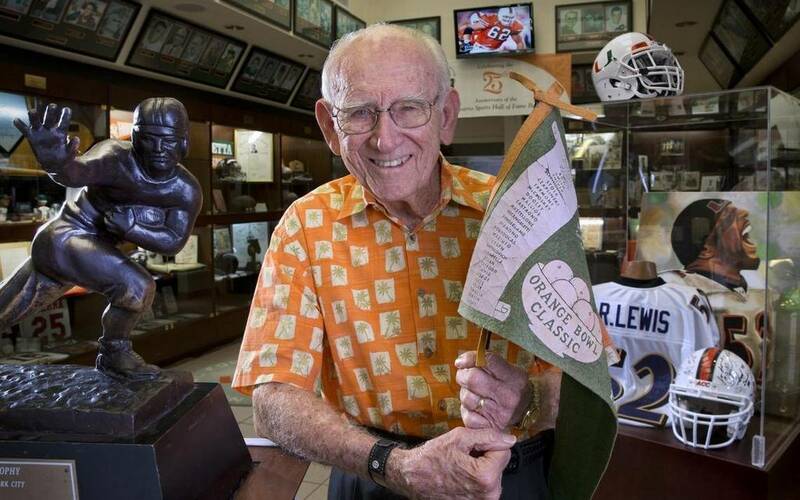 Hurricane fans can attend the Friday, January 11th VIP Opening by purchasing tickets for $50 that includes adult beverages and hors d'oeuvres along with being able to view and purchase one of the 20-25 pieces that commemorates a Hurricane legend or a historic moment in the school's athletic history. The Hall will be open to public on Saturday, January 12th from 12-7 PM to view and buy the artwork, and Beau Bradbury will be at a booth at the Beaux Arts Festival Saturday and Sunday. Proceeds benefit the UMSHoF, a 501c3 non-profit organization that celebrates the rich history and outstanding former student-athletes of the university. For more information, call the UMSHoF at 305-284-2775. Coral Gables, Fla. - 1983 National Championship Coach, UM Sports Hall of Fame member Howard Schnellenberger, has been tapped to serve as the celebrity host for the 26th Annual UM Sports Hall of Fame Celebrity Golf Tournament to benefit the Hurricane Club, to be held on Friday, October 5th at the prestigious Crandon Golf Course on Key Biscayne. "I'm delighted to have been asked to serve as the host of this year's Hall of Fame golf tournament." said Coach Schnellenberger. "My years at Miami were some of the greatest times in my life...not just the games and the championship...but having the outstanding young men I coached, our fine coaching staff, the support staff and administrators I worked with, and being around the Canes fans. I look forward to seeing them at the tournament and throughout the weekend." 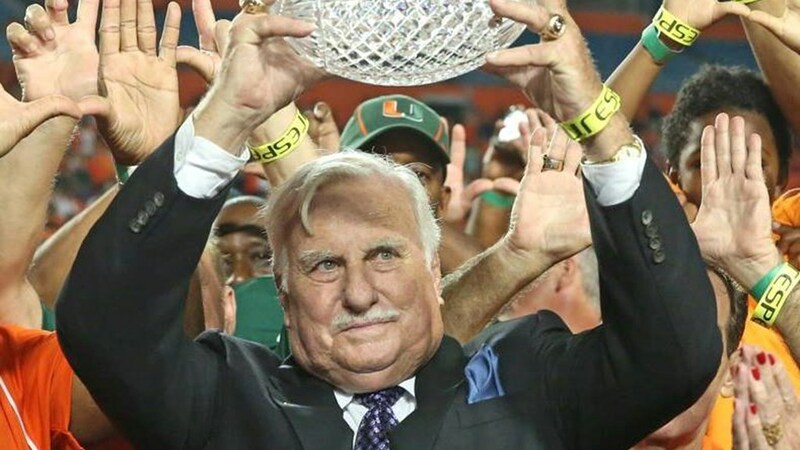 "We are honored to have Coach Howard Schnellenberger, our FIRST football National Championship Coach, as our host of the 26th annual UM Sports Hall of Fame Celebrity Golf Tournament," said UMSHoF President and Golf Chairperson, Tracy Kerdyk. "The Hall of Fame golf tournament has evolved and grown each year and we expect another sell-out as we continue to raise valuable funds for athletic scholarships through the Hurricane Club." Coach Schnellenberger led the Canes to the "Miracle in Miami" National Championship in 1983 by defeating the overwhelming favorite Nebraska Cornhuskers 31-30 in the 1984 Orange Bowl Classic. Having taken the job as head coach five years earlier, he promised the school's fans a championship "within the first five years", and upheld that pledge. He recently retired from coaching after a stellar career that spanned nearly six decades as an assistant and head coach. The event is scheduled for Friday, October 5th, the day before the Miami-Florida State football game, and kicks off with registration and lunch at 11:00 am followed by a 12:30 shotgun start on the 18 holes of the prestigious Crandon Golf Course at Key Biscayne. An awards dinner featuring live and silent auctions, will follow in the club house. Corporate teams of four golfers are available for $1500. Sponsorships are available. 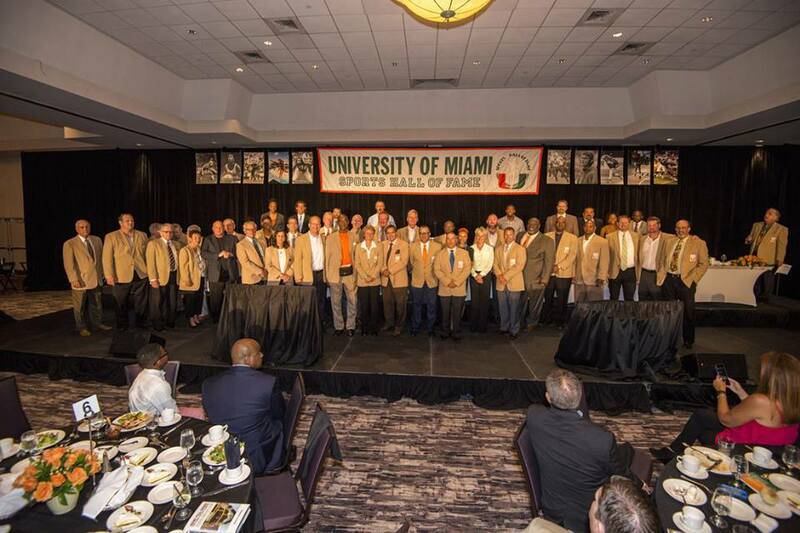 Go to CanesGolf.com or call the UM Sports Hall of Fame at 305-284-2775 to inquire about your company becoming a sponsor. A Special THANK U to these UMSHoF members and South Florida celebrities for these videos..